There really is no place like home for the holidays. Dig out your Christmas CD’s or setup a Christmas music playlist on your iPod. 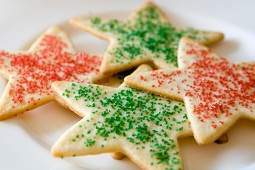 Play your favorite Christmas music as you turn your kitchen into a Christmas cookie bakery. Get the recipes for your family-favorite Christmas cookies together. If you don’t have any recipes, you can find some great ones here. Give your kids some hands-on fun and let them help out with your holiday baking. You don’t have to be a top-notch baker to enjoy this experience; it’s more about enjoying the season and time with family and friends than it is about the cookies (but tasty Christmas cookies do make it even better). Cost: You only pay for the ingredients you need to bake the cookies you want to bake. This is one of my personal favorites and it’s an especially kid-friendly, fun way to get into the Christmas spirit… Get in the car and with the sole intent to find the house with the best Christmas lights and decoration display. 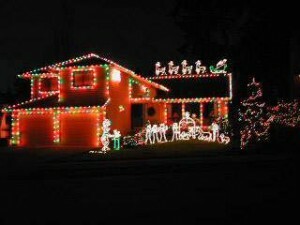 Some people go way over-the-top on Christmas decorations, your mission is to find them. While on your tour, tune your radio into 93.9 FM (The Lite); during December, this radio station plays holiday music exclusively. You may even want to bring some of the Christmas cookies you baked earlier. Cost: You only pay for the gas you use while on your Christmas lights tour. There are many area charities and organizations that could use some extra help this holiday season. Donating your time and energy to helping other who are less fortunate than you, is a great way to experience the true meaning of Christmas. Christmas is about giving, and giving to those in need you will undoubtedly fill you with the Christmas spirit. Many of the volunteering opportunities available are kid and family-friendly. Some local volunteering opportunities are available at DuPage Pads, the DuPage Convalescent Center, or a DuPage food pantry. You can also find more volunteering opportunities at volunteermatch.org. Cost: Your time and transportation. Gather up the kids and take the Metra train to Chicago (kids ride for free and weekend rates are usually discounted). 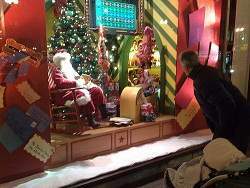 Once downtown, check out the elaborate window displays at the State Street Macy’s department store. If you arrive at the Ogilvie Transportation Center, take the Green Line or the #20 bus to Macy’s (it’s too far of a walk, especially for young children). If you arrive via Union Station, take the #60 bus to Macy’s. Macy’s exterior Christmas display windows progress all the way around the building, so be sure to check them all out. Keep it cheap, bring a thermos of hot chocolate to enjoy (and keep warm) as you go. Bring a backpack with snacks and/or sandwiches to enjoy on the train. There’s something magical about the big city during the Christmas season. The sounds of bell-ringers, the Christmas lights and decorations, and the Christmas music piped onto the streets makes for a memorable Christmas outing that is sure to get you and your family in the Christmas spirit. Cost: Adult-fare Metra tickets to and from Chicago.